The Orchestra of Indian Hill surprised me with its quality performance of innovative repertoire in the Littleton HS Performing Arts Center on March 23rd. Truth be told, I had never really noticed this orchestra, until its concert of women composers caught my eye. This programming came about in unusual fashion. Many ensembles are adamant that the Board and Council – volunteer trustees who provide governance to orchestras—do not weigh in on the artistic decisions the Music Director and other staff make. But in an innovative move, Music Director Bruce Hangen took an idea from a member of the Council of Indian Hill Music. Supporter Mark Scheier had heard author Anna Beer on National Public Radio, discussing her 2016 book “Sounds and Sweet Airs: The Forgotten Women of Classical Music,” and proposed that the entire concert be inspired by the book. Hangen agreed, but added two works by New England composers to expand the European perspective of the British Anna Beer. The result—an entire concert disclosing music unfamiliar to conductor and instrumentalists—made for moving and delightful discovery for all involved. Fanny Hensel’s Overture, an engaging show-opener, generated a sense of anticipation by building, sustained lines and questioning gestures of the slow introduction. These are finally thrown open by the cascading outburst that rushes from the violins, followed by majestic exchange between the strings and brass. The formal clarity of the motives and brisk figuration give an energetic mood which continues to build. In recent years, quite a few ensembles have put recordings of this work up on YouTube, but there is still only one commercially available recording, that of The Women’s Philharmonic from 1992. By the way, after reading the 2010 biography “Fanny Hensel, The Other Mendelssohn,” by R. Larry Todd, I’m convinced that she preferred Hensel as the most appropriate version of her name. But as long as that name is unfamiliar I do see the practicality of using the name that shows the link with her more famous brother. Elizabeth Maconchy (1907-1994) was born in England to Irish parents. She is best known for her chamber music, especially a stunning set of 13 string quartets. In his pre-concert talk Maestro Hangen recounted some interesting aspects of Maconchy’s life, for instance as a treatment for the tuberculosis she was diagnosed with in 1932, she and her husband lived outdoors in an open hut in the countryside for several years. The two short pieces by Maconchy intrigued in different ways. Nocturne (1950) built gradually with thickening textures of small melodic ideas, repeated scalar fragments, moving as subtly shifting ostinati. Through this undulating structure, broad-spanning melodic lines meander. Solo violins emerge in octaves with striking clarity, and harp accentuates the ostinato. The effect is lush and dreamlike, a remarkable use of orchestral color— a work to sink into again and again. Maconchy’s Proud Thames Overture, which started the second half, earned a prize as a coronation tribute for Queen Elizabeth in 1953. Here a simple motive outlines a tritone, and builds to imposing majesty with full use of brass and percussion. Clara Schumann’s Piano Concerto (Op. 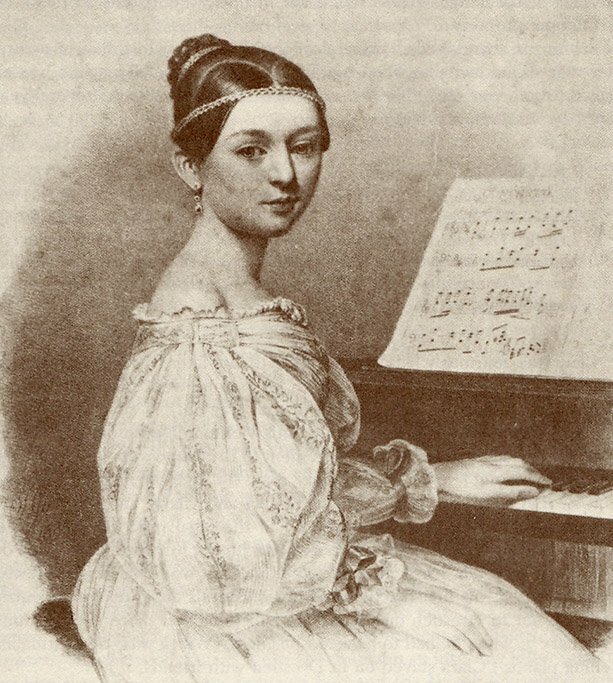 7) can hold its own with the best of the mid-19th-century concerti, although she was only 13 years old (and thus still Clara Wieck) when she started writing it in 1833. She completed the last movement first, and her friend Robert orchestrated it. Two years later she expanded it with the first and second movements, with no help from Robert. The first is a dignified Allegro maestoso, with strongly chiseled motives and bold exchanges between the soloist and orchestra. Janice Weber was the elegant and refined pianist. She brought no theatrics or extraneous gestures, just a magnanimous understanding. The second movement (the movements are performed without a break), Romanze, struck a completely innovative moment, as the solo cello (the remarkable Shay Rudolph) introduces the movement’s introspective tone and evocative lyricism, which the piano then explores alone. Eventually (Weber’s and Rudolph’s eyes met briefly) the piano is rejoined by the solo cello — the orchestra is entirely tacet in this movement! The vigorous Finale, Allegro non troppo, has the character of a Mazurka, propulsive and bold. Weber provided plenty of excitement and brilliance with virtuosic cascades of notes, but also a momentary flashback, as the intimacy of the piano-cello duo was recalled. The audience was quickly on its feet in a deserved ovation for Weber and all involved. Lili Boulanger (1893-1918) is best known as the first woman to win the Premiere Grand Prix de Rome in 1913, and as the sister of Nadia Boulanger. D’un Soir Triste (performed here) and its companion piece D’un Matin de Printemps, were the last pieces that Lili wrote in her own hand; her final work, Pie Jesu, was dictated to her sister in the weeks before Lili’s death (of Crohn’s disease). Given that there are two recordings of the orchestral version (both from the 1990s; there is also a version for piano trio), D’un Soir Triste is one of Lili’s most performed orchestral works; the BSO will perform it in February 2019. In preparing the work for its US premiere in 1986, Nan Washburn of The Women’s Philharmonic observed that Lili’s “deteriorating condition at the time is sadly evident in the manuscript scores themselves … by the uncharacteristic and numerous alterations and overall visual weakness of the penmanship.” D’un Soir Triste, a somber but lushly orchestrated work of impressionism, builds in waves of intensity through layering of colors and sonorities. At the beginning shifting chords are transparent with open fifths, but then more dissonances are added and tension builds with dark ascending arpeggios. The wave breaks with a fortissimo gong and pulsing bass drum, and the texture ebbs to pointillism with harp, and solo strings. D’un Soir Triste and the upbeat D’un Matin de Printemps share motivic material, but were not necessarily intended as a set, and it’s interesting that the two recordings order them differently, The Women’s Philharmonic ending with D’un Matin de Printemps, so we can shake off the gloom of D’un Soir Triste, and the BBC Philharmonic the other way around, so that D’un Soir Triste “is a dying composers unhappily realistic commentary on the all too transient radiance of a spring morning” (CD note by Gerald Larner). Following that we heard the sparkle of Amy Beach’s lovely waltz, Bal Masqué. Beach wrote this 1892 work for piano, and, we might assume, orchestrated it as part of her study leading up the composition of her monumental symphony that she started in 1894. There’s a warm contrasting melody introduced in the B section by the cellos, and when the A section is recalled, it’s embroidered with a filigree of countermelody. Hangen gave the imaginary dancers a challenge with his fluidity of tempo and gently eased phrase-endings. It was a pure delight. Peggy Stuart Coolidge (1913-1981) is a composer whose music I first heard on recently, when the Landmarks Orchestra gave the premiere of her Isabella, composed in honor of Isabella Stewart Gardner [HERE]. Her Spirituals in Sunshine and Shadow apparently does not quote any historic spirituals or folk tunes; instead Coolidge’s own melodies are striking and memorable. The first movement was energetic and rugged, evoking a western “Marlboro Man” character, with the melody soaring over a pulsating accompaniment. In the deeply moving second movement, the thought struck me that had this composer had some of the opportunities and advantages that Lenny Bernstein had by virtue of being male (for instance, Boston Latin School and Harvard) she too might be a household name. As it is, there are no books or studies of her music, her centennial went by unnoticed, and we have a lot of her music yet to discover. Here she creates a hushed and evocative atmosphere with an oboe soliloquy supported by warm string commentary that invites a poignant cello solo. A jazzy, jaunty third movement featuring the trumpet section turned out to be a brief interlude leading to the final section, a vigorous folk (-like) melody played with great energy in unison strings. It was a dynamic and exhilarating conclusion. A musician friend visiting from the D.C. area joined me in attending the concert, and we were both bowled over by the richness and depth of the sound, and the excellence of expression of the OIH. Although there were occasional fluffs and moments of inaccuracy, there was also a sense of real excitement and satisfaction. The combination of visionary programming, outstanding musicianship and bonuses like great pre-concert talks by Hangen, and post-concert events including discussion with the artists (and with coffee and delicious mini-crème-puffs), left me quite smitten by the Orchestra of Indian Hill. In the interest of transparency, I should reveal my intersecting loyalties. I am President of an organization, Women’s Philharmonic Advocacy, that gives small performance grants to encourage orchestras to program works composed by women; OIH received one of these grants. Second, we (WPA) have launched into music publishing, and OIH performed from our new edition of Amy Beach’s Bal Masqué, which previously had only been available in copies of manuscript score and parts.